I guess I would say my taste for home decoration is a little eclectic. I love all things pretty and frilly, but at the same time I do love a nice bold modern print. 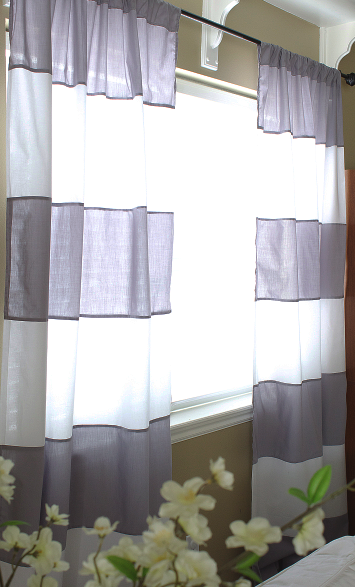 I wanted some striped curtains really bad, but didn't like the price tag that came along with them. I knew I could come up with a cheap and easy way to make the exact curtains I wanted. I would so much rather spend my extra money saved on a new shirt or a couple cute outfits for my kids from baby Gap! I made these curtains-two panels-for about $10ish total. Yea... dang cheap. The fabric I found was on sale and then I used a coupon on top of that. I wanted the fabric to be lightweight so that the light from the sun would still shine through. Depending on the look you are going for, the cost of fabric will vary. A total of 8 yds of fabric. Isn't that awesome! 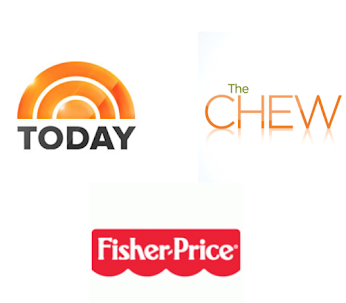 Find some on sale, or use a coupon. That is what I did! You can get a little bit more just in case. I always like to be a little on the safe side in case I mess up. 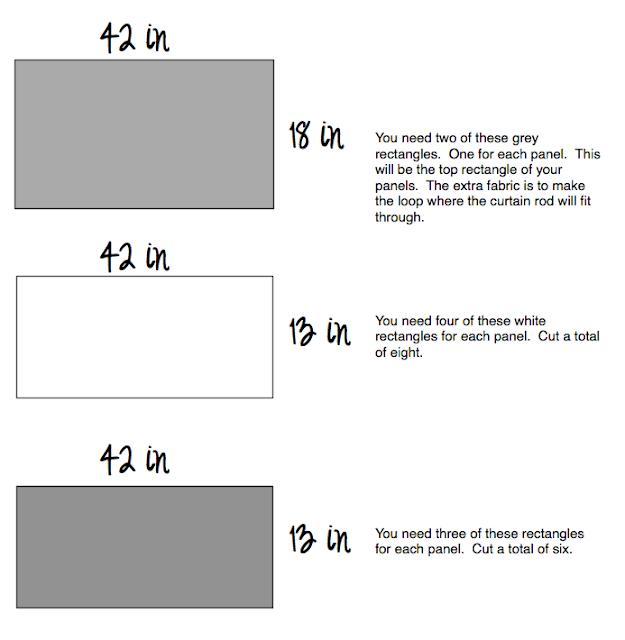 Below is the pattern, or the cuts you need to make with the fabric. Most fabric on the bolt is between 44"-45". You can have each panel be whatever width your fabric is off the bolt. Mine just happened to be 42 inches. Once you have cut out all your pieces sew each piece together one by one. Be sure to sew right sides together so that all the seams will be on the back side. I made sure to iron between each time I sewed a piece together. Sew one, then iron, sew another, then iron. Believe me it will be worth it in the end to add the step of ironing. 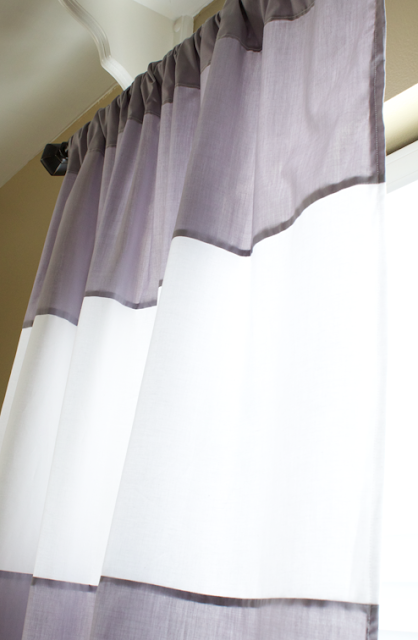 Be sure that the large 42x18in rectangle is at the top of each curtain you make. You will need that extra fabric to fold over so that you can loop it through the curtain rod like the picture shows below. Simply fold over the top extra four inches and sew into place. Finally once all eight rectangles are sewn into place you can hem the sides and bottom of your curtains. Make sure to iron your hem before you sew. 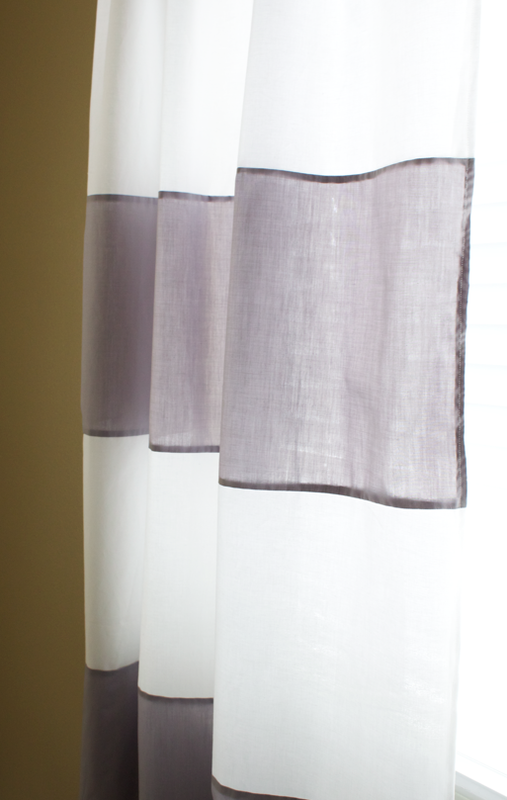 I double hemmed both sides and the bottom of my curtains so they looked finished and polished. These are amazing!! I may actually make some myself now! Oh thank you @jodi and @jessica! You are all so sweet! I wish I lived next door to you! I love all of your posts! I have only dared to sew one set of curtains in my home, but they turned out better than anything I could have bought. I think I will try these for my art room, they're gorgeous. Thanks for sharing! @the things I see.. I wish you lived near me too! We could be great craft buddies! Thanks for your sweet compliments! Megan, I love these! I have to know where you got the fabric from for that cheap?! That's crazy! @Jonie - and thank you so much! I love this post simply because I am in the middle of sewing curtain panels myself. I hope mine are pretty as yours. I found you through Plucky's Blog Hop! Though I say "hello!"